Joe began his business career as a trader on the Sydney Futures Exchange where he worked from the early 1980s until 1998. He subsequently managed a diverse portfolio of assets in telecommunications, media, technology and financial services for Queensland Press Ltd., and in 2003 began investing his own capital through his investment vehicle Jaymsea Investments Pty Ltd. Despite his commercial success, Joe found himself at age 40 overweight and in ill health, and elected to take matters into his own hands. After consultation with noted US doctor Joel Fuhrman, Joe embarked on a 60 day journey of transformation across the US, consuming nothing but the juice of fresh vegetables and fruits. That journey – filled with personal milestones for Joe, and eye-opening experiences with average Americans-- was captured on film, and has become the award-winning documentary Fat, Sick & Nearly Dead. 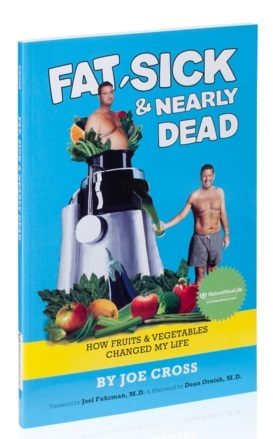 Seen by more than 20 million people around the world, Fat, Sick & Nearly Dead has inspired millions of people to follow Joe’s example and reclaim their own health and vitality by adopting plant-based eating habits. The response to the film was so overwhelming Joe founded Reboot with Joe, a health and wellness company that offers support, encouragement, community, media and tools to everyday people. Joe lives in New York and Sydney. I think good storytelling is a natural gift, however I always think of the audience when telling a story, be it a book, a film or a speech. Being able to alter your perspective is a powerful tool to good storytelling. I would say my biggest success would be overcoming a chronic autoimmune disease that I had for 8 long years, which required taking pills every morning and every night. I overcame this illness by turning towards a strict fruit and vegetable consumption, consisting of juices, smoothies and salads. Being healthier and medication free is definitely my biggest success. Personal: I turn 50 this year and I would like to think that I can be healthier and fitter at 50 than I was at 40.
Business: There are many stakeholders involved in business – be it shareholders, staff, customers, suppliers, and the environment. I guess my aspiration is to balance all of those so that I can under-promise and over-deliver on each and every one. I’d say my most challenging moment came in April of 2011. I had spent the last 3.5 years filming, editing, and promoting my first ever feature documentary, Fat Sick and Nearly Dead. I had spent an enormous amount of money, was well over budget, and had not achieved any income at all. It was a couple of months before launch on to Netflix, and although I had been resilient in my confidence, I had one night of doubt while walking the streets of Los Angeles. The period only lasted 4 to 5 hours, but I got on the phone as I got on the phone to a good friend of mine in Australia, we talked it through, and I was back on track. But for whatever reason, that was the night when the most pressure was on, the most money had been spent and the most doubt was there. I’ll never forget that evening, and it certainly has made me stronger. You don’t learn anything new, you just remember what you’d forgotten. I love meeting people that are passionate about what they do. I find that inspiring. On a boat on water. Not sure if I have favorite products in particular, but products I use a lot are my iPhone and MacBook Pro. I love my Nike trainers, I’m a big fan of treadmills, I’d be lost without my headset and I love a good pillow. Passionate about storytelling, meeting interesting people, and learning. I’m passionate about trying to hit a golf ball longer and straighter. Passionate about the consumption of fruits and vegetables. And I’m passionate about my new film, The Kids Menu.